Materials which may cause a fire, asbestos, gas bottle, fridges, freezers, overloading, tyres or food waste are not permitted. The skip is hired for a maximum period of two weeks. Skips can be hired longer by arrangement. It is the customer’s responsibility to contact the company, to arrange collection of the skip. Skips on the road must be lit and it is the hirer’s responsibility to provide the lights. If the skip is going on the road, a space must be saved for the day of delivery, as trying to locate parked cars is time consuming and sometimes unattainable. This could mean we are unable to drop the skip, and a journey will be wasted and may be charged. When a skip is ordered off road, the hirer is responsible to make sure the skip is loaded correctly and there is no waste left on the highway. Any fines or court action summoned by the local authority will be served to the hirer. We will use reasonable care and skill when delivering and collecting the skip. We reserve the right to refuse to deliver a skip if the ground/space is unsuitable. 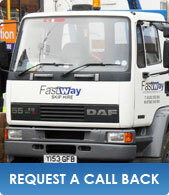 We may charge a reasonable amount if we are unable to deliver a skip to due unsuitable ground/space. It is the hirers responsibility to ensure there is sufficient space for the skip.